This museum is in a pretty park and features works by the 19th century Livorno-based movement led by the artist Giovanni Fattori. Giovanni Fattori (September 6, 1825 – August 30, 1908) was one of the leaders of the group known as the Macchiaioli. Fattori was born in modest circumstances in Livorno. His early education was rudimentary and his family initially planned for him to study for a qualification in commerce, but his skill in drawing persuaded them to apprentice him in 1845 to a local painter, Giuseppe Baldini. The group of painters to which Fattori belonged became known as the Macchiaioli. They were forerunners of the Impressionists and, like their French counterparts, were criticized for their paintings' lack of conventional finish. The Macchiaioli did not go as far as the Impressionists did in dissolving form in light, however, and when Fattori visited Paris in 1875 he reacted unenthusiastically to Impressionist works, expressing a preference for the artists of the Barbizon school. Military subjects dominate Fattori's output, although he also painted portraits, landscapes, and horses. 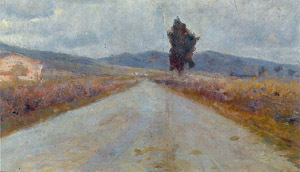 His painted sketches made outdoors are typically painted on small wood panels; these were used as reference material in painting larger compositions, such as his Branding of the Colts in the Maremma (1887). He produced a significant number of etchings as well.